The Master of Public Health scholarships are open to applicants for the July 2016 intake. Criteria for the scholarship include academic and professional merit. 10 scholarships valued at $4,000 each will be awarded. ACU has achieved above world standard in research in the area of Public Health. The Faculty of Health Sciences is one of the largest faculties in Australia providing leadership and teaching in areas related to nursing and allied health. We offer a wide range of inspiring courses at undergraduate, postgraduate and PhD levels. Study with leading academics in the field of public health and take your career in health sciences to the next level. ACU is at the top of the field in Public Health and Health Services research. ACU has been awarded an ERA score of 5 (top score – well above world class) in this discipline by the Australian Research Council. You will have the opportunity to undertake a unique specialisation, Global Health & Advocacy, which will extend your core public health knowledge through study of global health, sustainable development, food security and humanitarian assistance. ACU’s specialisation in Global Health & Advocacy will prepare you to work within the new global health framework established by the United Nations’ Sustainable Development Goals. You will learn to not just implement policies and programs that improve population health, but to actively influence policies and programs and advance population health. ACU’s new public health programs have been developed in response to the evolving role of public health practitioners within the Australian health system, and internationally. You will be equipped to engage in health improvement, promotion and protection, and contribute to the betterment of public health by preventing disease and prolonging life. ACU’s Master of Public Health aims to equip you with specialised knowledge, understanding and skills in public health to improve and advance population health and well-being. The Master of Public Health program will prepare you to practise with a community, national or global focus, and with an ethical, social justice perspective. This program emphasises evidence-based practice, rigorous intellectual inquiry, innovation and thought leadership, as well as development of effective communication and advocacy skills. 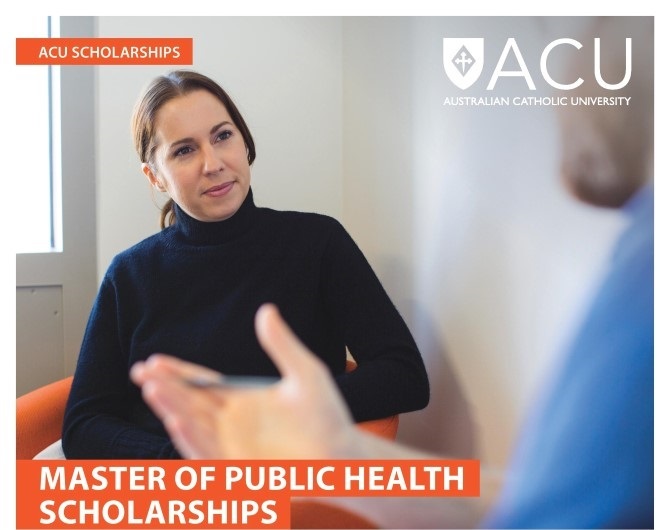 ACU’s Master of Public Health program has been designed around the Foundation Competencies for Master of Public Health Graduates in Australia and the requirements of the Australian Faculty of Public Health Medicine (for medical practitioners specialising in public health). Other international competency and practice standards and conceptual frameworks have also informed the Master of Public Health curriculum design. Project Pathway: specified specialisation units (60cp) and capstone experience units (20cp). Approximately half of all graduates are employed within the health sector, with others finding opportunities within education, government and services sectors. Managerial, analytical and program/project-based roles are common destinations. For many health practitioners, particularly medical practitioners or registered nurses, this program expands their career opportunities within their existing field (e.g. different roles or modes of practice). * This is an example course outline only.